My own guess would be that these messages (Restless Bandit Jenny has been very busy) are part of a phishing scheme, but it's entirely possible that there's an employment matching scheme that that's this stupid. I can kind of see a connection: human spaceflight and swimming both involve people moving in a zero-G environment. job posting for an Architect – the brick-and-mortar (or steel-and-plumbing) kind. 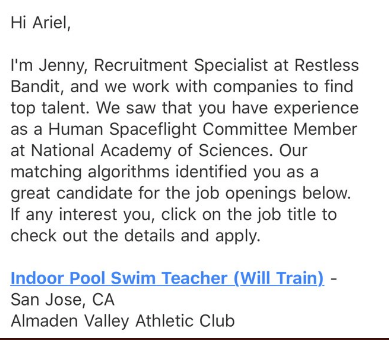 I suppose that a Human Spaceflight Committee Member might be a better fit for Indoor Pool Swim Teacher (Will Train) than for Indoor Pool Swim Teacher (Experience Needed). I got a recruiting email through LinkedIn for a position in my field requiring a doctorate when my education listing makes it clear I have multiple masters degrees but no Ph.D.
No, you guys, it's because her name is Ariel.